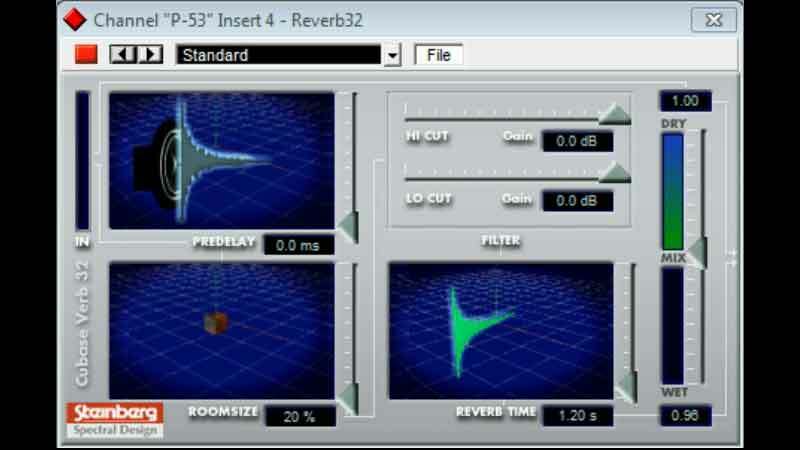 A Reverb Plugin allows us to add artificial Reverb to any sound. Natural Reverb (reverberation) is all around us. Sometimes we notice it, but usually (especially outdoors) we don`t. 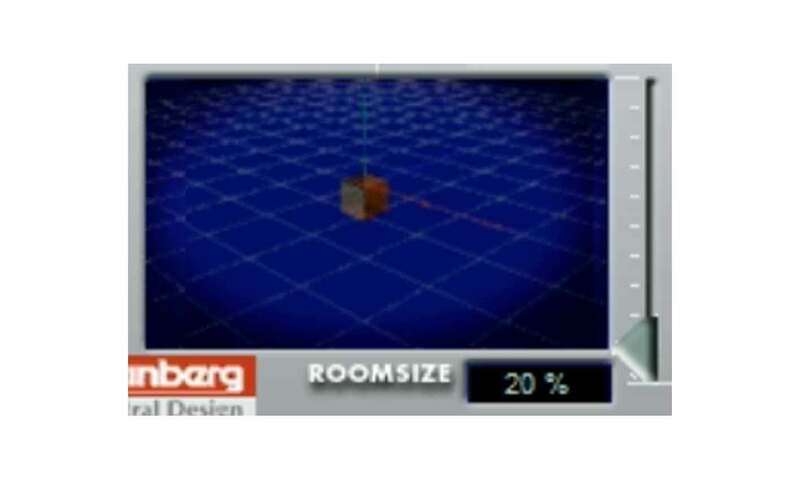 Unlike echo which produces a couple of distinct reflections (which can be heard as clear copies of the original sound), Reverb produces thousands of reflections. 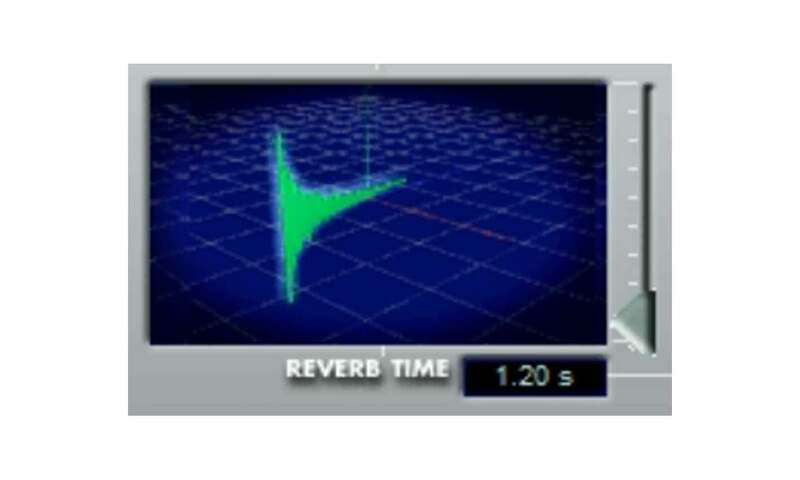 The time between Reverb reflections are very short (less than 1ms (millisecond - 1,000 in 1 second)); therefore, we hear one continuous sound that hangs around for a while. The quality will vary greatly depending on how they are built. A high quality commercial unit will always sound better than a freebie. This is more so than any other type of effect plugin. When producing sound effects, you can usually use anything from lo-fi to hi-fi (high fidelity). But you will notice the difference in quality between Reverbs. I personally like using a mid to high quality Reverbs, as the quality always shines through. As always, use the tools that give you the quality of effect that you are looking for. Sometimes lo-fi is a requirement when producing certain types of sound effects. Lo fi - Hi fi. "Low quality will usually sound harsh and cold. Good quality will be smooth and warm." When working with your Reverb Plugin you may want to keep a close eye on the VST performance metre. This will show you how much of your computer processor resources that the plugin is using. The bigger the room, the bigger the sound will be. 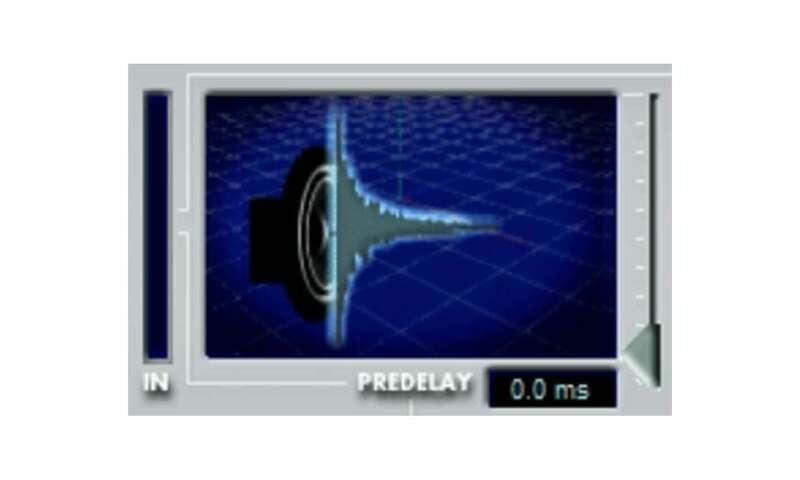 The delay time between the original sound and the Reverb tail. This sets the length of time the tail hangs around for. 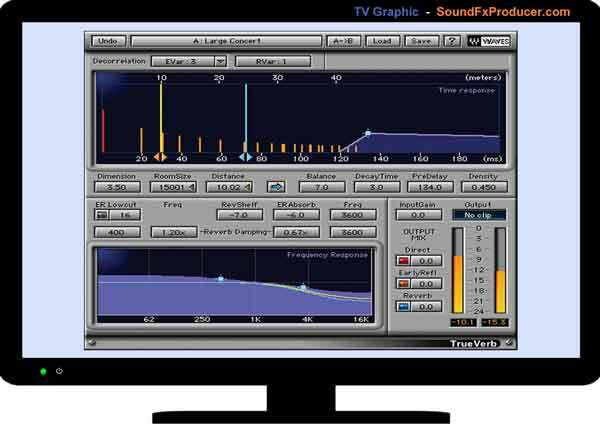 Add an amount of damping to the sound by removing parts of the frequency (sound vibrations) range. 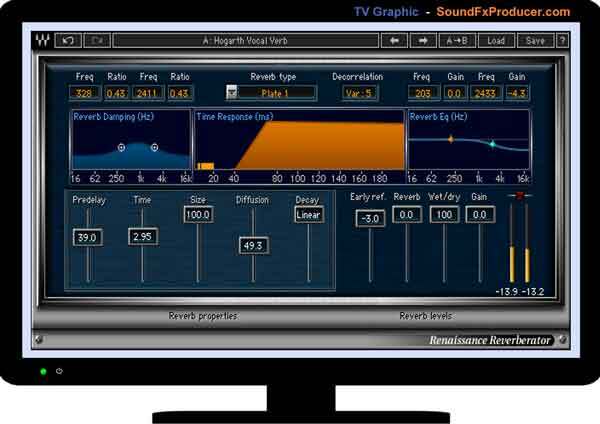 • Remove some of the high frequencies to make the sound appear more distant. • Remove the low frequencies to reduce rumble. If the balance is set exactly in the middle (Mix) like the picture below, the sound will be 50:50. 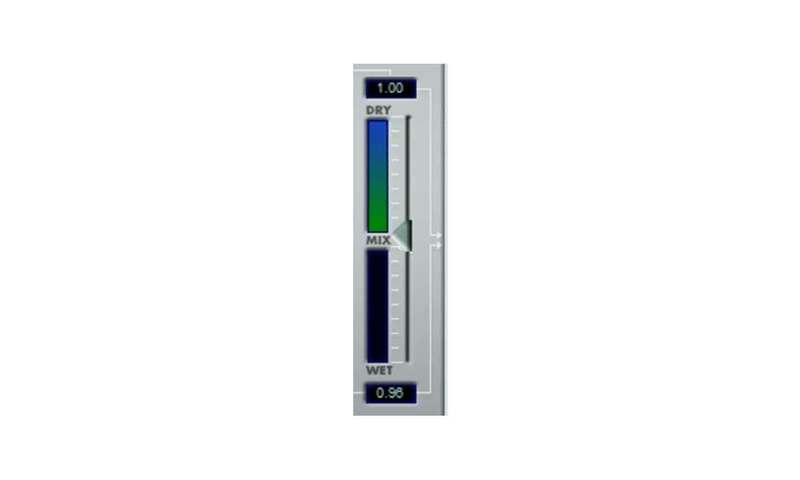 It will be a mix of exactly 50% dry sound and 50% reverb (wet) sound. It is quite common to have the controls set like this for most effects as it allows us to clearly hear how the effect is changing the sound. Check out the video below which shows all the screen shot controls above in operation. (A simple, short synth tone is used to compare the sound before and after). This is a very simple plugin (certainly not high-end), but it shows how (with graphics) the controls effect the sound. The important thing is that it shows the main controls that are used in all these plugins. 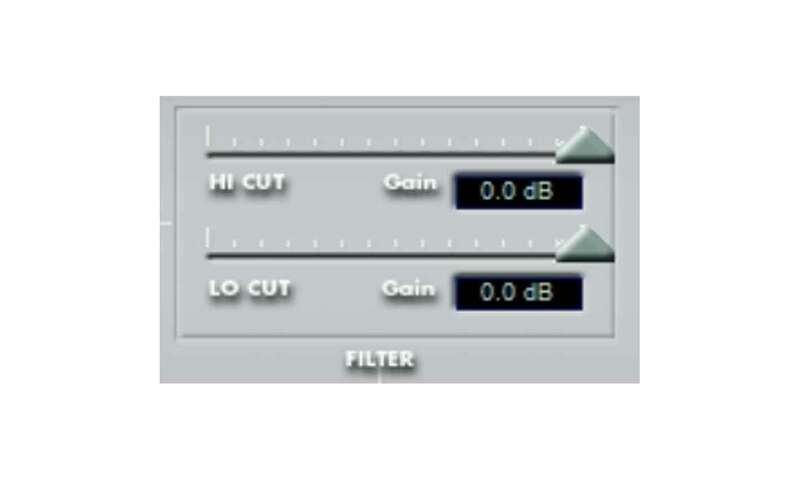 High-end plugins will have many more controls to fine tune your sounds (as seen in the waves plugin screen shots at the beginning of this page). "Note, first part of video shows the controls without sound."